Day 153: Gotta Get Down to Swingtime . . .
To this day on Classic Rock stations, you can hear the music of the Steve Miller Band, AND, if you’re from “that era”, you’ll immediately be transported back in time to the high school gym and the “Homecoming Dance” or the “Valentine’s Dance” or whatever dance your school called it–way back when!! All we know is that it was really good music and it’s stood the test of time. In fact, one of Brian’s favorites to this day is Steve Miller’s ‘Swing Town’. It starts with a great riff and his vocals…wow, what a terrific combination!! All of this is a great lead-in to tonight’s wine. Jean picked up a nice little blend while ‘browsing’ at H-E-B; traveling to the Sonoma County area in California, the 2009 Swing Time Red from Alexander Valley Vineyards is a nice blend of Cabernet Sauvignon, Syrah and Zinfandel…WOW, imagine that…a red wine blended with our three favorite grapes!!! The catch in our case was that this wine–doesn’t exist! We searched multiple sites — and even looked at the Alexander Valley Vineyard site — only to find nothing about this wine, SO here’s our take. Beautiful color. The nose was musty…like it needed serious air-time. The first pour was musty on the nose and musty on the taste. We probably should have poured the wine into a decanter, but opted to keep swirling our glasses. The wine opened up–albeit reluctantly–and their was a distinct note of black berries and raspberries. Unfortunately, the taste was still controlled by the significant mustin ness. At the end of the day, there are tons of blends on the market. In a world where blends — formally the bane of wine makers and now the darlings of the new wine world — we suggest you look elsewhere. Alexander Valley Vineyards makes some great Cabernet Sauvignons and some truly amazing Zinfandels, like Sin Zin and Redemption…but this blend is a thumbs down. It’s tough to ‘Fly Like An Eagle’ when you’re trying wine that you wouldn’t serve on a ‘Jet Airliner’, but it’s good to know that you can ‘Take The Money and Run’ to the nearest wine shop and find your favorite red or white. Don’t be ‘The Joker’; try blends or other varietals that you really like and that make you ‘Dance, Dance, Dance’ Have a great Friday and we’ll be back here tomorrow night, magically, with another choice – – Abracadabra! Remember to enjoy your favorite wine responsibly and recycle whenever possible. Day 152: Adding it all up . . . So, here we are – 30 years of marriage + one day, and . . . yes, we are still together! Been to five different zoos – but love the St. Louis Zoo the best! Watched the Rams win the Super Bowl & lose the Super Bowl–Hmmm, Spygate??? Watched Kurt Warner in two Super Bowls with two different teams–which team does he wear going into the Hall of Fame? Driven over 900,000 miles – must be why we’ve had 19 cars ! Whew – makes us tired just thinking about it – can’t even begin to count the number of wines we’ve tried. So, tonight in honor of “numbers”, we decided to open Cuatro Pasos 2008 from Spain. Cuatro Pasos means 4 steps. It is made 100% from Mencia and brought to us by Bodegas Martin Codax in Cacabelos (Leon) and is part of the Bierzo DO (denomination of origin) in Northwestern Spain. Calling it ‘old vines’ would not be an exaggeration since the grapes come from 80-year-old stock. When we poured it into a glass – it was deep, dark red with a hint of violet . . . but mostly ruby-red. On the nose it was so-so, nothing to write home about, but you got the whiff of cherry and fruits with a dash of toasty cedar – again not a nose bomb, but enough to peak your interest. Taking a sip took you down a path of rich fruit – not overpowering, but fruity and flavorful – smooth and balance, but again not overpowering. The finish was also smooth – went very well with Brian’s Kung Pao Chicken – spicy, but not overly so and the wine really balanced everything out. Jean picked this wine up during a midday stop at HEB in Austin for under $12 – haven’t seen it here in San Marcos, but if we do find it – would definitely purchase again. Seems to go well with food (and Thin Mints courtesy of the local G.S.’s). 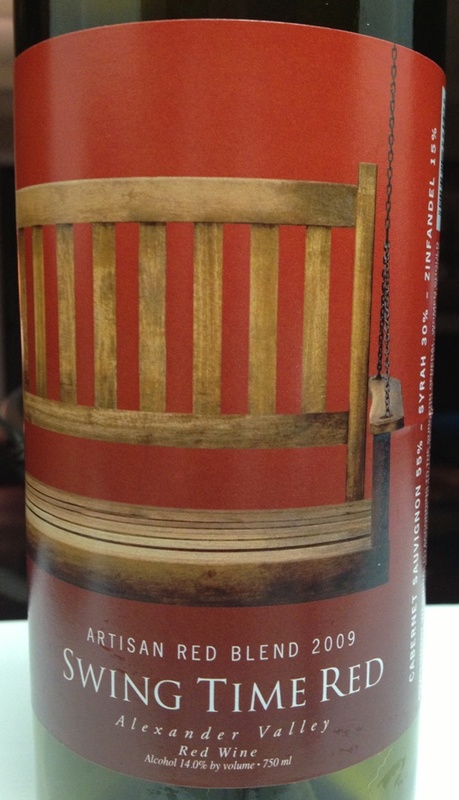 We could see this as a great deck wine – wishing it wasn’t so dry here so we could even put a fire in the pit. So, as we take one final look at our “list” – we do realize that it “adds up” to a wonderful life thus far – we have many more years together ahead of us – but up to this point, it’s been pretty darn spectacular. Please remember to enjoy responsibly and recycle whenever possible . . . Categories: Uncategorized | Tags: 1983, baseball, Columbia, Fishing, football, Kurt Warner, Mark McGwire, RAms. St. Louis Cardinals. Challenger, Sammy Sosa, Super Bowl, Wine | Permalink. Day 150: Life Around The Drip Line . . .
There’s something special about a wine that comes with a built-in drip stain. It’s sheer genius marketing. You look at it, and it’s got this beautiful dark purple line right down the middle of the label. We thought. . .no way, they could come up with such a cool idea. If ever there was a way to market a product and add that enticing look of “you really want to know what’s inside, don’t you?” The folks at Landmark are amazing. Now, we know there are savvy wine drinkers out there who’ll see the drip label and think that the wine is cooked and the cork has leaked. Uh yeah, but what happens when you pull the foil off and there isn’t a bit of red anywhere to be found. Could it be the finest marketing minds in the viticulture world have created the ultimate ploy to create desire? After opening this beautiful gem of a wine that Jean picked up on sale at Twin Liquor this evening, we were stunned. So beautiful. . .so dark berry and cherry skin scents, along with cracked pepper and black olive. . .all there–all pronounced. A tip of the bottle and the gorgeous color of the wine falling into the glass was a sight to behold. We really love looking at that deep, dark purple color as it envelopes the glass, and with a little swirling the air helps open the wine to bring out its fullest potential. 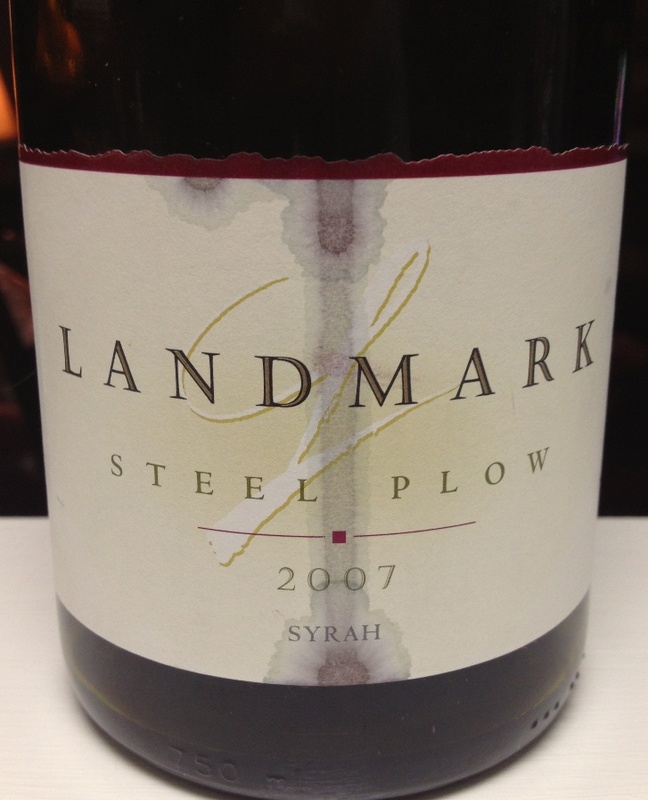 This 2007 Landmark Steel Plow Syrah from Sonoma County is no slouch in the wine world. It’s got serious pedigree and years of healthy reviews, so we knew that it was going to be something worth trying. What we didn’t count on was the amazing taste of this wine. . .deep and sweet on the palate, with chewy dark fruity flavors, firm tannins and a late note of tobacco that was surprisingly sweet. 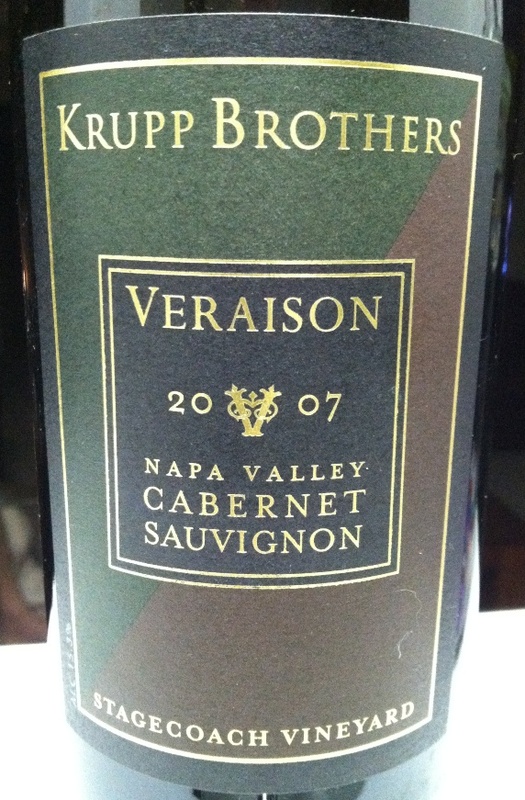 Another favorite of ours. . .the long finish was superb. As we did some research on this wine, we learned that International Wine Seller rated this at 91 points and previous vintages rated as high as 94 points. Wines like this typically don’t sell for less than $25 a bottle, but with the sale at Twin, it was more than worth the effort. Steel Plow is a great name for a wine–no doubt referencing the heritage of harvesting, but we just think it is a great name for a wine–especially with a cool label! And, one of the things that makes writing wine blogs so much fun is reading and posting what others say about the wine. We found this little ditty from http://spikesvino.com, “A slight lychee aroma with a hint of blue fruit, carried a generally very cool climate type of characteristics. Some eucalyptus aroma here too. The wine has a very pleasant taste with cool flavors such as lychee, blueberry and cool blue mint. A very tasty and juicy wine.” Now that takes the description to a new level!! But it does reinforce that this wine is one to sit back and relax with on a beautiful Saturday afternoon on the deck or a warm evening at home with a plate of delicious pasta. Either way you can’t lose–except that label! Okay, we’ll come clean. . .Brian opened the bottle and poured the first glass and didn’t bother to check for drips; by the time we caught it, too late, the stain had set and dried. (But, you probably knew this was coming.) However, we still think it’s kind of cool that the drip line goes right down the middle–like it’s supposed to be there–like it was designed by the marketing department. Hmmm, maybe we’ve started something. Their next wine could be called ‘Drip Line’!!! Alright, that’s enough for tonight, please enjoy your favorite wine responsibly and remember to recycle whenever possible. Categories: Uncategorized | Tags: Landmark Winery, Steel Plow, Syrah, Twin Liquors | Permalink. Day 149 – A Foreshadowing of Things to Come . . .
Can you believe that we are entering the final week of January? We just turned the calendar on the new year yesterday, and now we’re coming to the end of the first month of the year. While one month hardly makes a year, there have been some interesting things taking place during the beginnings of the year. A deep freeze in the Midwest, Southeast and Northeast has yielded some record-setting snowfall amounts and frigid temperatures that haven’t been seen in this country for a number of years. Another phenomenon that has taken hold—we still laugh about it—our ‘friends’ at the Weather Channel have determined that we need to give ‘names’ to winter storms. Yes. . .and they have such mythological names on top of that! Dating ourselves once again. . .we remember when hurricanes only had the names of ladies. In fact, a LONG time ago there was a joke that went something like–“Do you know why they only name hurricanes after ladies?” Because no one knows what a ‘himmicane’ is!!!! Get it? Her-icane? Him-icane. Never mind. We digress–again. Seriously, have we gotten to the point in marketing that we have to name a winter storm? Like it has its’ own personality? Hurricane Sandy–or was it Super Storm Sandy–was kind of the poster child for naming storms beyond the normal ‘season’, so we’re guessing the folks at the WC needed yet another reason–besides Storm Stories–to get and keep your attention. And with our Congress now in full session and The Pres starting his second term; one wonders what kinds of new and exciting things are on the horizon for honest, hardworking citizens. We won’t go back to a previous blog, but we have enough reason to think it’s not going to be good for those of us who WORK for a living. Stay tuned—we’d love to be proven wrong. It is also amazing to see two completely different teams vying for the NFL Championship. Whether you’re a Ray Lewis-diehard Ravens fan (Like Father Leo from this past weekend) or a Colin Kapernick-new era 49ers fan. . .next week’s BIG GAME promises to entertain and provide a great reason to smoke some ribs and grill some wings along with family from Seattle! 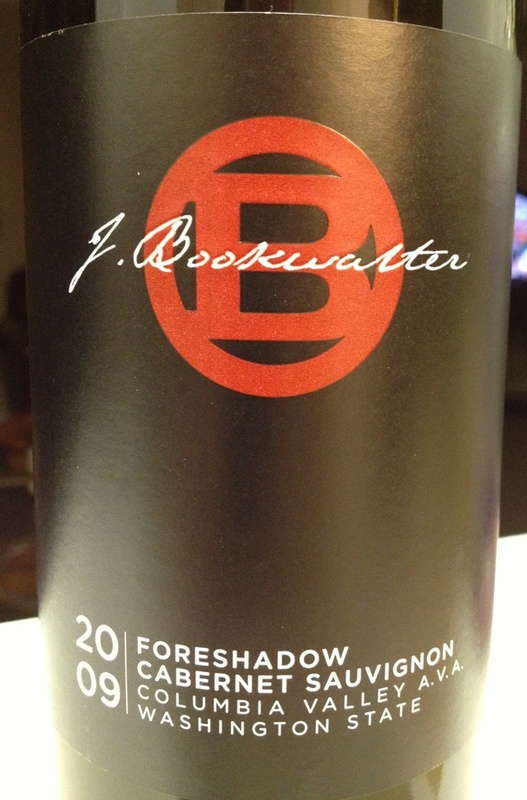 Going back out to Washington, we came across this beautiful 2009 Cabernet Sauvignon called, Foreshadow from J. Bookwalter Winery of Richland, Washington. A product of the Columbia Valley A.V.A., it’s 96% Cab and 4% Syrah–while it doesn’t officially qualify as a blend, the addition of the Syrah adds a certain richness to the wine together with a smooth taste. Truthfully, we stumbled upon this one at Gabriel’s in San Marcos this past Saturday, and since we were looking for something different–it was one of our selections. After a little research, we realized that we had a full-bred winner on our hands. Wine Spectator has given this wine 93 points–“the wine displays a medley of dark fruits led by plums, blackberries, blueberries and figs. Secondary and tertiary notes are more subtle and offer hints of truffles, violets, baking spices and sandalwood followed by a warm cola bath. The wine enters the palate sweet and round and finishes with polished, fine grained tannins. The lush, long finish is complimented by the natural sweetness and acidity of the wine.” Wow! We figured that we were buying a pretty good blog wine, but had no idea it had garnered any significant amount of press. As good as this wine was upon opening, we actually pumped it up and saved it for today, and were rewarded with intense fruit flavors, a beautiful nose of coffee and chocolate–and such a smooth, long finish that it was downright disappointing to see the bottle empty. While not in our ordinary price point, we got this for a little more than $25 a bottle, we can tell you that it retails at the winery for $45 a bottle. The reviews on this wine are consistent and continuous–great wine, better than higher priced cabs, another winner from Washington. Somehow, we figured that we were going to find this wine because of our last Washington tasting. . .it’s like—Foreshadowing! As the last week of January unfolds, there is much going on in our world. We imagine that there is much going in your world as well, and that is EXACTLY why it’s good to have options when it comes to wine tasting. We hope that you’ll continue to enjoy your favorite wine responsibly and remember to recycle whenever possible. Categories: Uncategorized | Tags: Columbia Valley, J. Bookwalter Winery | Permalink. Day 148 – Good Wine Should Be Shared . . . Following an evening of good thoughts, good topics, and praise for outstanding “heroes”, we ended up in the lobby of the Austin Renaissance Hotel and decided that it was time to celebrate. “The Team” had put together and pulled off an outstanding evening honoring Catholic Schools in the Diocese of Austin. One of the best parts of the evening was getting to visit once again with Fr. Leo Patalinghug – he is AWESOME! So, there we were with about 8 people all sitting around, relaxing, unwinding, and it was time to bring out some good wine. Sadly, the hotel WiFi wasn’t so free, and it was already today when we sat down to write – so we finished out tasks in Austin, came home and took a nap and are now tying this entry up to post. Funny thing about a bottle of good wine (and eight glasses) it doesn’t last long. 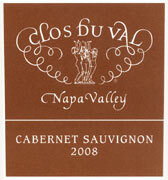 Add in the fact that we enjoyed a 2008 Clos du Val Cabernet Sauvignon, and you have the makings of a great way to wrap up the night. The nose on this wine is stellar. Deep, dark fruit with hints of oak, chocolate and spice converge to make the wine almost too good to drink. Continuous swirling allows the wine to open and close as the aroma intensifies. The beautiful color of the wine adds to the ambiance of the nose. Clearly, this is a wine that can be enjoyed in so many different ways. Tonight, it was purely enjoyed by itself–a victory toast of sorts for the hard work put in by so many people in helping make an event even better than anticipated. However, we all agreed that the wine could be even better with a nice thick slab of dark chocolate–you know, 70% cocoa. Naturally, a wine as big and bold as this cabernet would be the perfect compliment to a thick, juicy steak. The list of pairings for this wine could go on and on. The taste was fruitful; the oakiness subtle but the bursting of flavors really comes out on the mid and back palates. The finish is long, long, long and it was evident that we were all in the mood to savor the finish. As one person was observed, just smelling the glass was almost as good as drinking what was in it (nice job there SW). At a little over $30 a bottle, this wine can be found on sale at numerous places for slightly under $25, and if you come across a sale like that, we heartily recommend that you take advantage of it. This wine is rated at 91 points and the vintages before and after are rated in the same range or higher. The “drink-ability” of this 2008 Cab is good now through 2017. Lay it down or pour it–either way, this wine is an excellent value for the money. Yes, this was an evening to share some good wine over some great conversations and relaxation! It’s one of those wines that you break out when you know something really good has just taken place. We really enjoyed sharing it with multiple people–because we enjoy sharing wine. As the blog continues to unfold, we’ve really learned to appreciate the sharing aspect of wine. Whether it’s sharing through actually pouring a glass with friends or family, or it’s sharing by writing about different wines that we’ve tasted. We now have our work cut out for us. Because the evening was so successful, we are posting day 148 today, and we’ll have to ‘take one for the team’ and post Day 149 this evening!! Ah, the sacrifices we have to make to maintain continuity!! Please continue to enjoy your favorite wine responsibly and remember to recycle whenever possible. Categories: Uncategorized | Tags: Austin Renaissance Hotel, cabernet Sauvignon, Catholic Schools in the Diocese of Austin, chocolate and spice, Clos du Val, clos du val cabernet, food, Fr. Leo Patalinghug, thick slab | Permalink. Tonight we enjoyed listening to and watching Father Leo Patalinghug from the Baltimore Diocese who also happens to have beaten Bobby Flay in a Fajita Throwdown! His book, ‘Grace Before Meals’ was the stage for tonight’s dinner Celebrating Catholic Schoolsin the Austin Diocese. About 100 people attended this amazing, entertaining and thought-provoking cooking demonstration. The food was beyond delicious; the commentary while he cooked, was inspirational and at the same time very important to hear. As we enjoyed dinner, Father Leo talked about sitting down to dinner as a family. The dinner table literally becomes a family retreat. Part of the way, we as parents, are to raise our children is teaching them at the dinner table. By ‘feeding’ their minds, we educate them to become better women and men. It’s a thought process not lost on us. Even though both girls are off at college, we made it a point to have multiple meals at the table while they were in school. That time–around the dinner table–was a chance for them to talk about their day, to update us on the latest trends or just blow off some steam about a teacher that “didn’t know what she was talking about!” The fact of the matter–Father Leo was right–family time at the dinner table is a crucial component to feeding the minds of our kids. As he pointed out so eloquently, we’ve become too dependent on fast food–trying to nourish without the ingredients necessary to feed. As you read this and if you have kids, how often in a seven day week do you sit down at the dinner table and feed your kid’s minds? Not just food enters their systems at those family gatherings, and as we found out at Christmas, when we DON’T sit at the table, mom and dad are called into question—“Why aren’t we sitting at the table?” Because we’re too busy watching tv? NOT a good answer! The reality–our girls understand and cherish the value of having a meal at the dining room table. Father Leo was right–feed them, nourish them, teach them and then watch them shine. 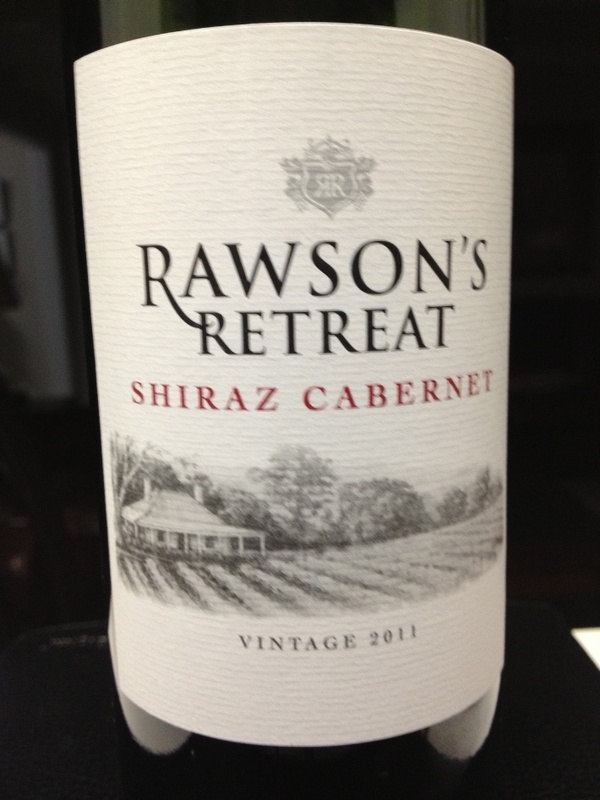 So, tonight after getting home pretty late, we opened a value-priced wine called Rawson’s Retreat. It’s a 2011 Australian Cabernet Shiraz blend and we’ll get right to the point. It was horrible. It tasted like cranberry juice cocktail–without any taste. Tart. Sour. Not what we’d expect from an Australian wine; however, we tried it because this wine was priced at less the $9 a bottle but we have to admit, it was OVER priced. There is some good wine coming out of Australian–we’ve written several different blogs about a few of them–unfortunately, this isn’t one. The nose was bitter, the taste on the palate was undistinguished. When opening the screw-top bottle, it popped like a cork under pressure–never had that happen before with a screw top. The finish was essentially non-existent. We love wines from Australia, but this is one you can leave on the shelf. Clearly, it’s designed for folks who don’t, won’t or can’t tell the difference between good and bad wine. Our comment to the folks at HEB–find someone else to sell it. We were relieved to learn tonight that some-not all-of the things we did with the girls as they were growing up–we did “right.” Feeding children is WAY more than just providing them food. The food comes from us as parents. What a terrific way to tie together the concepts of educating and feeding — they’re really the same thing. We hope that you enjoy your favorite wine responsibly, of course. Remember to recycle whenever possible–we are, after all, leaving a legacy for our children and grandchildren. Categories: Uncategorized | Tags: Father Leo Patalinghug, Grace Before Meals | Permalink.